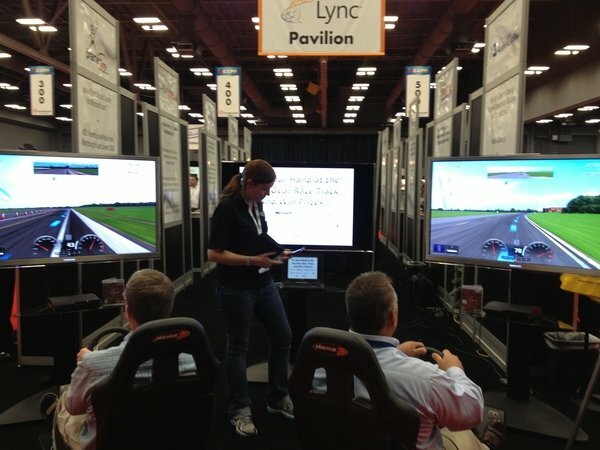 I was passing by the huge Microsoft Lync Pavillion at ITEXPO, when my eyes spotted two large screens with a racing game being played in the Microsoft Lync Pavillion. The woman told me it's a timed competition with prizes being given. I fully expected to see a Microsoft Xbox 360 under the TV monitors when what do my eyes see? Two Sony PlayStation 3s - one under each TV. Oh the sweet irony. See, now when you come to ITEXPO it's not all work and no play. Ok, now back to walking the show floor after I attempt to beat the best racing time!